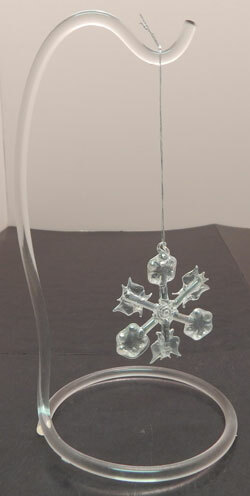 This clear acrylic ornament holder has a unique design aesthetic. With this ornament display you can create an eye catching yet functional display area. The simple design allows this item to blend in well with any pre existing aesthetic. The materials used in the construction of this ornament provide the maximum amount of durability. This ornament display also features flame polished edges to create a clean and professional finish. This acrylic ornament display stand is available in 3 heights and can be used to create eye-catching displays. The stand is 1" in diameter with a 1/2" inset. Available in 3 heights or in a set of 3. Choose from the height options below. 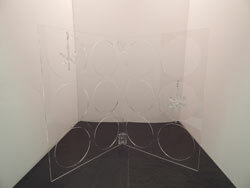 This ornament display stand is constructed of clear, curved acrylic. It is ideal for counter top display or for view in a display case. One piece construction allows display stand to remain steady. Choose from the size options below. This acrylic ornament stand his hinged in the center. It holds up to 12 ornaments and is available in 2 sizes. This is a great way to display multiple items using minimal counter space. Choose from the size options below. © Copyright 2015 Achieve Display. All rights reserved.